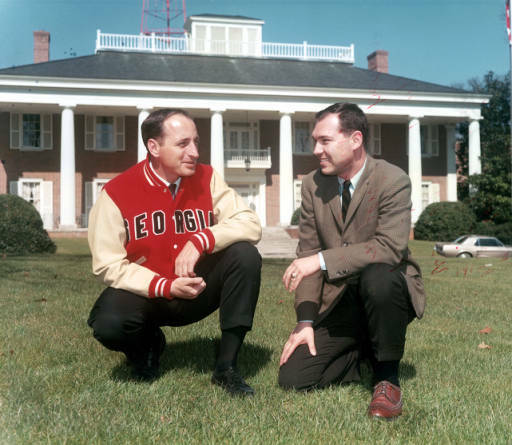 UGA football coach Vince Dooley and WSB Radio Sports Director Phil Schaefer, a few years after WSB’s original song, “Won’t You Come Home Vince Dooley” played its part at keeping Dooley in Georgia. The early 1960s saw thirteen days of intense anxiety - the Cuban Missile Crisis. 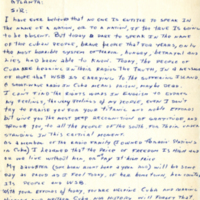 As tensions rose, the United States began attempts to win Cubans over to the American side and keep moral high for those rebelling against the communist government. 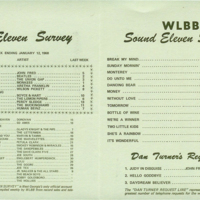 WSB in Atlanta was one of the radio stations chosen by the U.S. government to broadcast a Spanish-language version of “Voice of America” in these efforts. 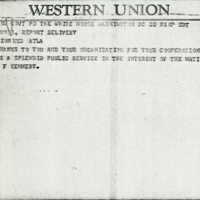 WSB was later commended by President John F. Kennedy’s administration for their help. 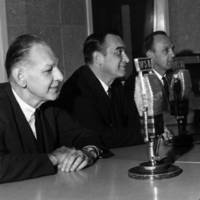 The 1960s were also an exciting time for sports broadcasting in radio. Stations covered local and national sports games, especially football and baseball. 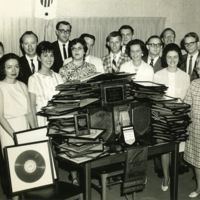 In 1965, when University of Georgia football coach Vince Dooley was reportedly considering leaving for another school, Elmo Ellis and Sherrie Johnson of WSB recorded a song, “Won’t You Come Home Vince Dooley.” Whether or not the song can take the credit, Dooley stayed at UGA. 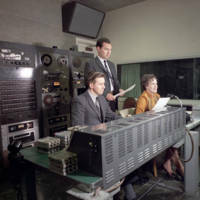 Many stations continued to broadcast music to their listeners. 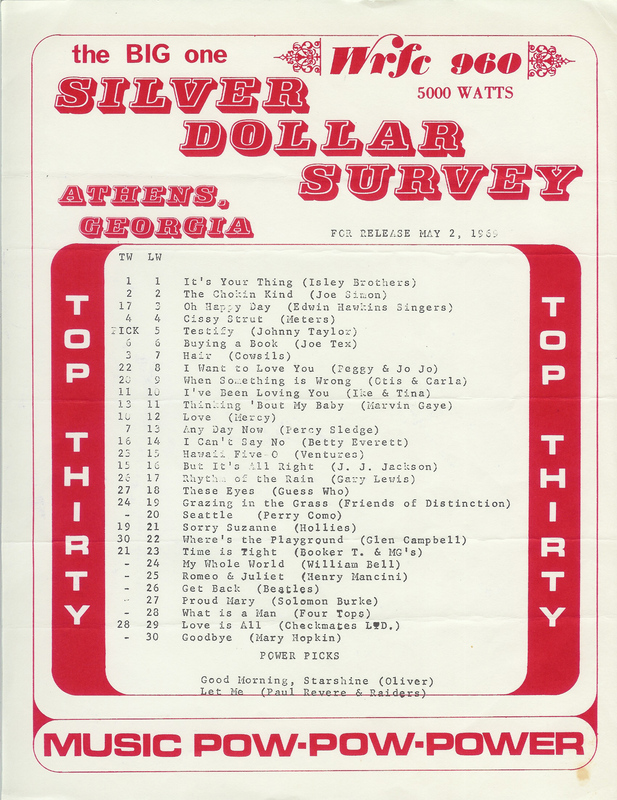 Popular songs were tracked through station surveys and larger national lists like the Billboard Top 100. Station managers and disc jockeys could choose from these songs to keep their listeners happy. 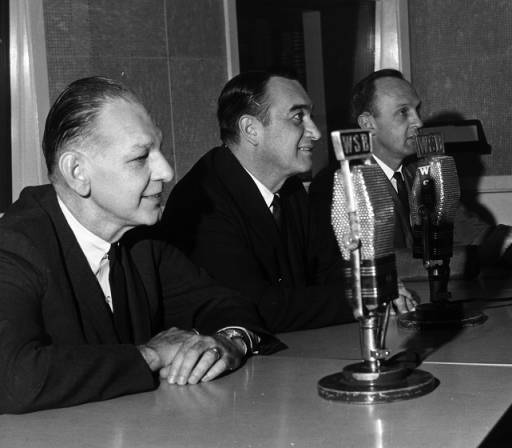 Hank Morgan, Mel Allen, and Ernie Johnson provided Braves baseball commentary on WSB. 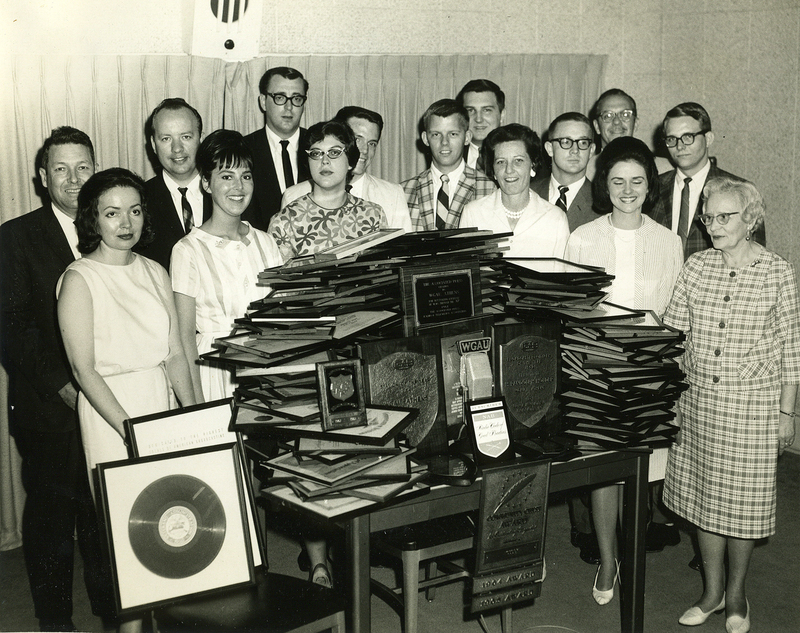 WSB was not the only station to be recognized; WGAU (Athens) amassed a literal heap of awards by the 1960s. 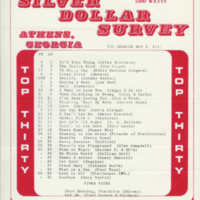 Stations carefully tracked top songs through services like Billboard and their own music surveys, including this 1969 Silver Dollar Survey from WRFC (Athens). 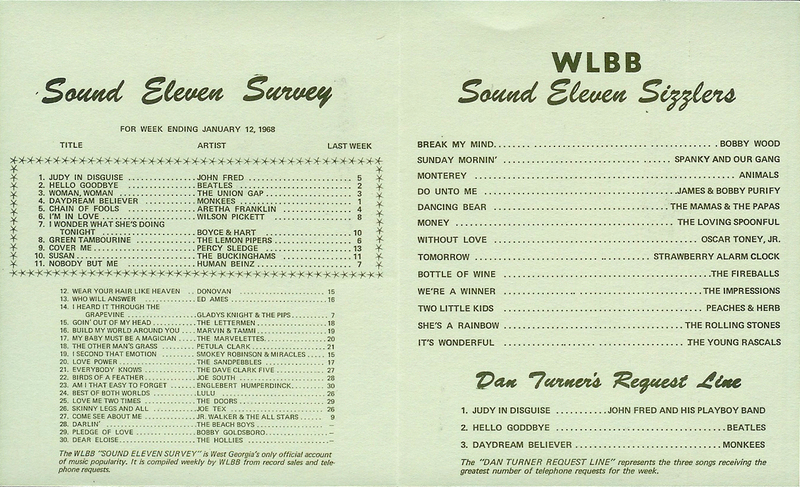 WLBB (Carrollton), known as Sound Eleven, brought pop music to Western Georgia with groups like The Beatles, The Monkees, and Aretha Franklin in 1968. 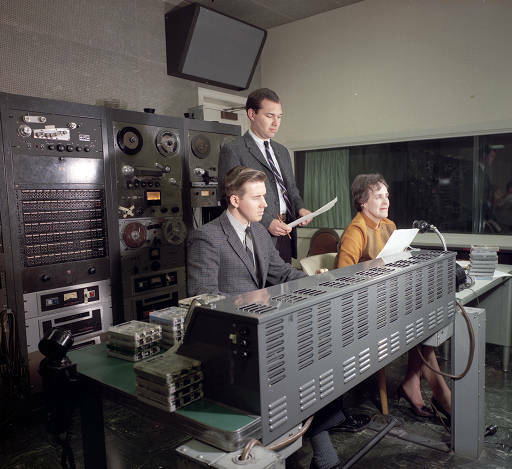 The WSB control room was a center of activity during the Cuban Missile Crisis broadcasts. 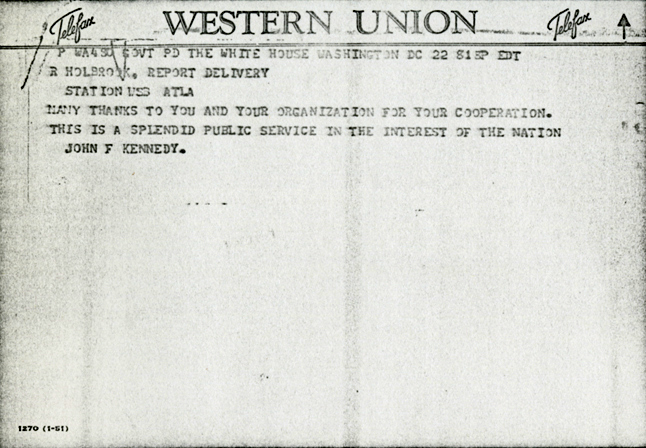 President John F. Kennedy sent a telegram to WSB thanking the station for their work during the Cuban Missile Crisis. 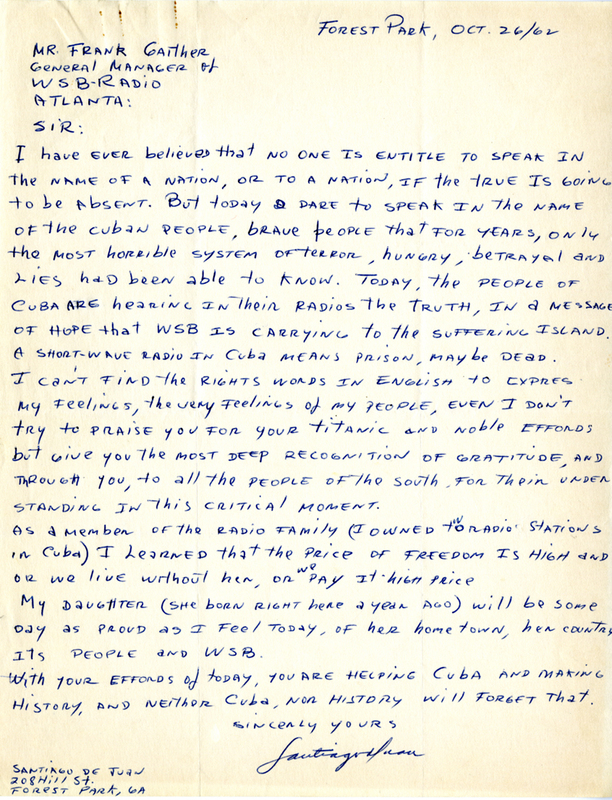 Santiago De Juan, a Cuban then living in Forest Park, Georgia wrote to WSB expressing his gratitude for the Voice of America broadcasts. 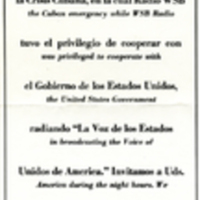 WSB distributed this flyer, printed in English and Spanish, thanking listeners for their understanding during the crisis.